Modern Performance - Sails rings around most "character boats"
Easy to follow plans - step by step instructions. The Goat Island Skiff is my most popular plan, the reason ... it is really pretty. So catches peoples attention. Once it has caught their attention they start to see other advantages. It is really light - which means that it is easy to move around on shore and is one of the secrets behind the modern performance. It actually weighs 10lbs LESS than a Laser Dinghy at 125lbs (57kg) - built of lighweight Gaboon plywood. It is also versatile - it rows quite OK, sails like a rocket and can take a small outboard. 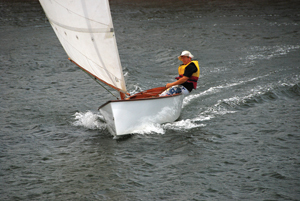 The Goat Island Skiff (GIS) is one of the easiest boats of its length to build because of the greatly reduced number of parts. One of the fun things about the GIS is that the lug rig upsets racing type sailors - they ring me up and email me asking if they could put a more modern rig on the boat. So far I have managed to convince all of them to stay with the four sided lug sail - and all of them have been grateful when they realise just how quick this sailing skiff goes. The lug sail is highly efficient, quick to rig and unrig. I know everyone says that "their" lug rig is highly efficient but I have done significant research into the type and my own development through the 15 years I have had BETH the sailing canoe. Both the GIS and BETH will give modern boats a run for their money and will sail rings around other character boats and the many Lumbering lumberyard skiffs. One of the biggest hints I can give them is to specify a low stretch halyard for the mainsail - spectra or dynex - it means the sail shape doesn't deteriorate through stretch in the rope - well worth the extra $15. If you are used to sailing modern dinghies like the Taser, Laser, Sabre - ie regular modern dinghies - you will find the Goat has much of the feel of these boats. Lively and responsive. It can sail in modern company and not be completely outclassed. However it has a much greater carrying capacity than any of the modern boats. I have had it out with 4 Adults and it sails very nicely indeed - an advantage of the easily driven hull form. The other advantage of the lug rig is that it reefs very simply - the sail area is quite big at 105 sq ft (9.75 sq m) so with the hull's light weight it has quite a big power to weight ratio for good fine weather performance. When the weather blows up then it can be reefed for good control. This is also why the GIS is relatively cheap to get on the water - having a single big sail is a lot cheaper than having several smaller ones. Generally adding a jib doubles the cost of rig and sails. 2/ Whether the designer understands the capabilities of the materials being used. The plans for the GIS are more like a book than a plan. Detailed information on each building step, how to join the plywood, how to mark the shapes of the panels, how to use the epoxy - it is all there. More a course on boatbuilding than a simple plan. Less timber is used in the boat, which saves money. Less structure - which saves weight. Fewer parts so the boat builds much more quickly. Building space would not have to be enormous. I suppose the minimum would be around 18ft by 6ft - a standard carspace would be more than adequate. The boat is quite movable while under construction so could be worked on in the open and moved under shelter when not building. As the major ply components are constructed on the flat, very little space is taken up until over halfway through the project. This sailing skiff will sail much the same as most boats its size, but there are a few peculiarities that come with the flat bottom. As with almost all boats the skiff will sail fastest if sailed level - with little or no heel – the exception is in very light winds when you are struggling to get up any speed at all the boat can be heeled over to 20° This reduces the wetted surface by around 25%. As soon as the boat has achieved any sort of consistent speed it should be brought upright. When the water is very choppy the boat may slam badly if sailed upright. A small amount of heel will smooth its movement considerably. The minimum amount of heel that stops the worst of the slamming should be adopted. The forward and aft buoyancy tanks are designed for use as seats when rowing. The boat will perform best sailing with crew weight concentrated around the middle thwart. The final difference with many other boats is because there is no jib. This means that the mainsail boom should not be pulled in tighter than 10 degrees. The GIS can be carried on a lightweight trailer. It is certainly light enough to be cartopped - but it is bulky so we recommend a trailer. She fits nicely in a standard 5ft box trailer with an extended towing arm at the front. If rowlocks are to be fitted they need to go 300mm behind the back edge of the centre seat. The oars need to be 9ft long for best efficiency and the plans are free. There is always a bit of luck involved in designing a boat - here it was that the 9ft oars store neatly in the bottom of the boat. Because of its hullshape the Goat Island Skiff can't use more than about 3 or 4 hp effectively. In fact even 2 hp iwll push her along at good speed. Higher horspowers are not very useful because the hull is not the right shape to go faster - it will stand up on its stern and start pounding in waves. The GIS is set up to take small horsepowers (up to 3) already as the transom is braced by the knees in the corners and the top of the rear seat. For more info on motoring read the article from Dave Graybeal below under "satisfied customers". He is currently building the new hollow mast design so his boys can take her sailing. Hi, from Scotland Island.Today we used our light fast and pretty Goat Island Skiff as a concrete, blue metal and sand barge. Previous days have seen it used as a timber barge -- powered by an electric outboard!. When not in this guise it's main role is our commuter boat. But, once our renovation is a little further down the track, our GIS will once more become light fast and pretty sailing craft. Trust you are well and enjoying life. Q: That Mast Looks Heavy - is there an alternative? A: I have also drawn up a plan for a hollow wooden mast made of planks for the GIS - you have to alter the mast step and partner slightly. Drawings are now available and included with new plan sets. As usual the ligher structure is also cheaper because it uses less timber and the timber thickness is easier to find. A: Not too big - you won't go any faster and it might put too much load on the boat. Perhaps you can use a slightly larger outboard, but generally outboards don't take too well to running at low revs all the time - and it is another heavy bit to carry round. Be aware too that outboard weight is a whole field to itself. Generally a manufacturer will use the same engine as the basis for 2 or 3 models. So you may see an three different horsepower outboards all with about the same weight - ie they all use the same block and other internals. So do some checking before buying. The boat balances quite OK if there is someone else in the boat to sit on the front seat with the driver on the rear seat. When by yourself the boat will balance better if you make up a tiller extension for the outboard so you can sit on the middle seat. A tiller extension for the outboard can be made of plastic pipe to fit over the outboard tiller. There has been a lot of enquiry for a “bigger Navigator”. Someone said, “One with room to sleep on a nice flat space that doesn’t need rearrangement of the floorboards to stretch out”. Another said, “I have a family which is effectively four adults, and while Navigator will accommodate that many, we’d like a boat just like that but stretched a bit”. Others wanted more speed or more range, a motor in a well inside, room for more gear, and so on. Lots of enquiries. I’m looking forward to seeing some of these around; being honest I want to borrow one! Peter Croft's Cabin Version Pathfinder in Akaroa Harbor, New Zealand. 15knots, sun is shining, dontcha wish you could be taking a classic cruise on the hauraki gulf in your Pathfinder!